You’ve probably made a few photo collages in your lifetime, whether you laid out photos with the perfect amount of messy randomness in a photo album or magnetized a grouping on your fridge. But in the digital world, there’s not a lot out there that lets Mac users do the deed easily. I’ve painstakingly used Photoshop, Pages, and even iWeb to create collages, but nothing compares to the quickness and ease of Shape Collage. Shape Collage turns a collection of photos into a collage of practically any shape, whether you’re going for a traditional design or something totally out there. The interface is easy to use. You can select one of the preset shapes (a rectangle, heart, or circle) and type some text, or use a custom shape, which you draw within the app or import, to create something unique. Creating custom-shaped collages in Shape Collage can be fun. 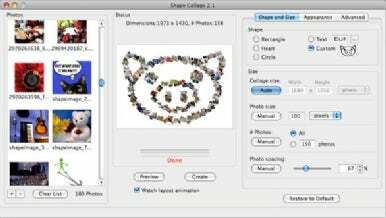 To select images, simply drag and drop photos from the Finder or iPhoto (including Events) into the interface, or have Shape Collage pull images from your Facebook, Flickr, or other Web page. Then select a shape or type text. You can also alter the size, number of photos used, photo spacing, background image, photo border, photo rotation, and shadows. Then click the Preview button to view a randomly generated wire frame of the layout. Once you have a layout you like, click Create to generate the final image as a PNG, JPEG, or even Photoshop (PSD) file for further editing (major brownie points here for the developer). For traditional collages, the rectangle shape and a handful of photos works best (I like the clean look of selecting None for Rotation under the Advanced tab), but for custom shapes and text creations, you may need more images than you think to give the shape better definition. While I had plenty of vacation photos to make a “Europe” text collage easily comprehensible, a custom “leaf” shape I drew using all 38 of my fall colors pics looked like an elongated blob. To compensate, set a higher number of photos to duplicate images when needed. While creating custom shapes was quirky good fun, I’m not sure I’d put this app to real use, but for creating more standard collages and photo text, Shape Collage is truly priceless.